Entwine put a little twist on this formula, essentially asking “what if both parts of the spell were optional?” In other words, offer two optional effects and let the player choose one or the other, then offer them both at a slight increase in cost? A good example here would be the common spell Dream’s Grip. It begins as all entwine spells do, with the characteristic “choose one.” Then it lets you either tap or untap a target permanent. Want to do both? Pay the entwine cost, and you’re in business. It’s worth noting that R&D played with the entwine cost right from the start rather than slow-rolling alternate payments. 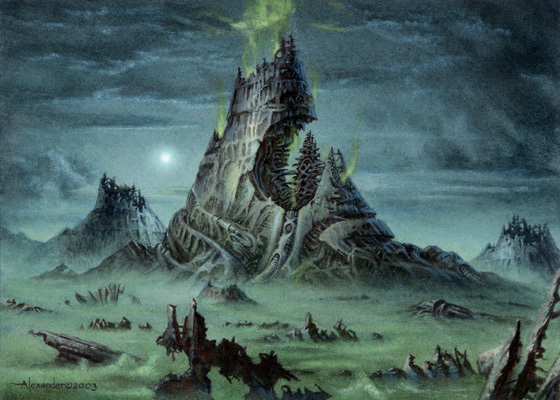 In Mirrodin itself you see the cards Betrayal of Flesh and Solar Tide which instead demand a sacrifice of land. This mechanic had its high point early, then was drawn back to make room for new designs in Darksteel and Fifth Dawn, appearing there in only a handful of cards (and, interestingly, clustered amongst the higher rarities). This all makes for interesting backstory, but our next set of innovations are where the real tragedy begins: artifact lands and affinity. They’re lumped together as they go hand in hand, and contributed to one of the darker times in Magic’s history. The concept behind affinity seems harmless enough: overcost something, then reduce its cost based on how many of a given something the player has in play until it’s (potentially) a bargain. 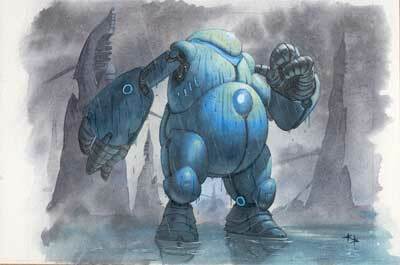 Most of the time, this “given something” was artifacts, making the spell one colourless mana cheaper for each artifact you had in play, but Darksteel would go on to introduce a cycle of Golems that had affinity for a corresponding land type (Spire Golem, for instance, had affinity for Islands). Common consensus holds that giving the players opportunity to have nearly anything for free opens up a real Pandora’s Box of abuse, but it was the artifact lands cycle that really put the nails into affinity’s coffin. The artifact lands were a nonbasic land that entered play untapped and provided mana of a specific colour- essentially, basic lands that were also artifacts. It was felt that the pros and cons of this characteristic balanced against one another- sure they count as ‘free’ artifacts, but they’re also vulnerable to artifact removal! A fine theory, but in practice these lands were essentially broken. Wizards had wanted to encourage play with artifact-heavy decks, and in hindsight it worked far too well. Players put together decks that used and abused affinity, and quickly the Standard environment of the time was essentially divided into two camps: affinity and anti-affinity. Not a healthy place to be, and the game lost a lot of players as a result. Lucky for us, the preconstructed world is a much more controlled environment, and today’s foray into the dark world of artifact lands and affinity- courtesy of the Bait & Bludgeon theme deck- likely won’t break the format and drive us from the game. Indeed, much of this deck should already be familiar ground, even if we weren’t playing during the original Mirrodin. The mana Myrs have resurfaced as a prominent fixture in Scars of Mirrodin, as have the Spellbombs. Additionally, many of Bait & Bludgeon’s characteristic spells and creatures have popped up in Planechase (Metallic Dreams), Archenemy (Assemble the Doomsday Machine), and even in Duel Decks (Elspeth vs Tezzeret). Ordinarily we might flag a nine-card top of curve with red, but as it happens Bait & Bludgeon has a substantial ramp package. To power out its more expensive offerings (as well as add to your artifact count), you have two each of the Silver and Leaden Myr as well as a full playset of Talismans of Dominance. To keep your hand full, you also have recourse to a pair of Thirsts for Knowledge as well as the somewhat-slower Serum Tank. Other minor inclusions which help support the overall goal of getting a high artifact count include some early defense (two Steel Walls and a pair of Bottle Gnomes), a pair of Aether Spellbombs for bounce/card draw, and a dose of recursion (two Myr Retrievers). On that small foundation rest the remainder of our creatures, which either have affinity for artifacts (making them cheaper to play) or simply benefit from having a large number of artifacts in play. We have a small but strong aerial contingent in a pair of Somber Hoverguards, two Nim Shriekers, and one of the deck’s two rares, the Broodstar. On the ground, we have a solid supporting cast of Frogmites and Myr Enforcers– three of each. Finally, the deck’s other rare- a Lodestone Myr– can reach some rather ridiculous levels of power if you have enough artifacts sitting around doing nothing. Of course, affinity doesn’t end there, as Bait & Bludgeon has a number of noncreature options which look to support the deck and take advantage of its heavy artifact component at the same time. A pair of Irradiates offer up an answer to most any creature-based threat, a pity you only have two of them (so make them count). Twin Assert Authorities hold the promise of a two-Blue Counterspell, with the added bonus of removing the countered spell from the game entirely. Of course, you’ll need five (or more) artifacts to get there, but then if this deck can’t manage that you’re probably already losing the game as it is. Then of course there’s Thoughtcast, a simple card-drawing engine, and one final pair of artifacts: the Scale and Tooth of Chiss-Goria, the great Furnace Dragon of Mirrodin. On top of this, the deck naturally includes a playset each of Seat of the Synod and Vault of Whispers, easy ways to increase your artifact count with little downside to your deck’s moderate speed. Although affinity and the Mirrodin environment wouldn’t break wide open until Darksteel provided such gems as Arcbound Ravager and Skullclamp, the seeds are here in this unassuming little microcosm of the set, Bait & Bludgeon. Two mix two metaphors, it’s almost as if you’ve captured a touch of the calm before the storm in a glass bottle. Join us next time when we take the deck into the arena and see how it holds its own against its rivals. Fun fact about this deck’s rare: Broodstar. I was around when the orginal Mirrodin block was released, and affinity as a deck was already kicking around, before Darksteel was even released. The orginal affinity deck was actually a control deck that used, suprise, Broodstar, as its finisher. Broodstar was actually a chase rare for a few months and this pre-con was highly sought after as a result. The release of Skullclamp took affinity into an aggro direction, with Arcbound Ravager replacing Broodstar as the deck’s finisher. I really enjoy Magic’s history, but for that large part in the middle I wasn’t around to witness it. Very cool, thanks for sharing that! I was around back then, too. Mirrodin block was probably the first block that I started drafting and playing in (small) tournaments, as opposed to the casual play I had done before.